Developers of apps that use satellite data to assist the agricultural industry took home the top two prizes at this year’s ESA App Camp in Barcelona. The App Camp offers access to the latest space data and the SAP HANA Cloud Platform to European app developers, who work to make the information accessible to a broad audience. As Europe’s Copernicus programme continues to launch the Sentinel satellites, transforming their data into accessible products that can benefit citizens poses both a challenge and an opportunity. The App Camp provides an occasion for developers to bring the data from these and other satellites to the everyday user via mobile apps. 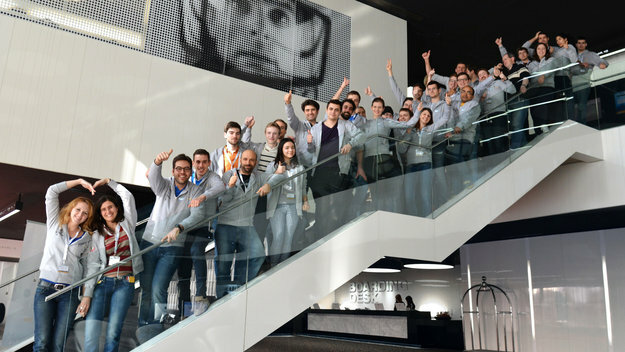 The six-day App Camp culminated yesterday in Barcelona at the Mobile World Congress, the world’s largest annual gathering of mobile and related industries, with two teams winning awards. Developers of the FarmIQ app won the ESA challenge. The app harnesses the power of Earth observation and agricultural big data to provide state-of-the-art crop monitoring, predictive monitoring and advance warnings of potential problems. AGRAI – an app that simplifies farmers’ work by advising them on their daily routines and issuing warnings on imminent issues such as pests, drought and frost – won the SAP special prize. Both winning teams received a cash prize of €5000. "We are extremely pleased to have added SAP as a valuable partner to our developer initiative. Combining Earth observation data with business data using the SAP Hana Cloud Platform can provide a myriad of opportunities for start-ups and developers," said Josef Aschbacher, Head of the Programme Planning and Coordination Service for ESA’s Earth Observation Programmes Directorate. More than 170 participants from about 30 nations gathered at six ESA Business Incubation Centers (BICs) and partner locations at pre-selection ‘Appathons’ across Europe in January. A winning team from each local Appathon was then invited to join the App Camp in Barcelona to further develop their app concepts. "An invention remains just an idea until someone invests in it," said Frank Salzgeber, Head of ESA’s Technology Transfer Programme. "That’s why ESA supports over 100 new start-ups a year at our ESA BICs. I’m sure that we’ll see some of the winners take advantage of our support, and we would be honoured to help their ideas take wing." Other apps developed during the App Camp included the EcoFit app to identify potential renewable energy sites and Malevich, a smart solar sales mobile app powered by a mix of Earth observation and business data analytics for energy providers. Viridian Raven, a mobile, space-based early-warning system for detecting bark beetle outbreaks in forests was designed to help reduce global insect-related forest damage through early intervention.SAMPEI offers a mobile solution for precision fishing that identifies phytoplankton-rich areas as potential fishing zones. "All six teams developed impressive applications during the ESA App Camp, making Earth observation data accessible to a broad audience and creating value in the process," said Thorsten Rudolph, Managing Director of Anwendungszentrum GmbH Oberpfaffenhofen. "They now have the chance to join the ESA BIC Programme and the SAP Startup Focus programme to develop their apps further." The event was organised by Anwendungszentrum GmbH Oberpfaffenhofen on behalf of ESA, and sponsored by SAP University Alliances.